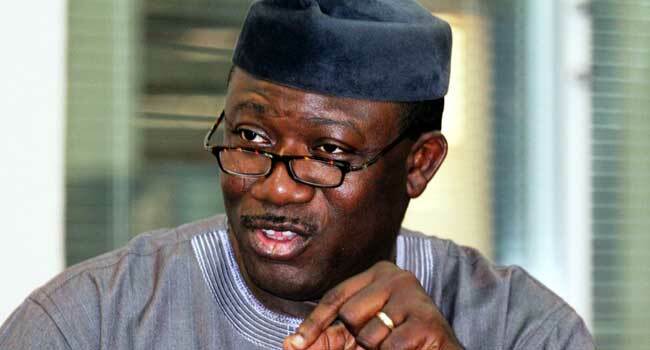 The Minister of Mines and Steel Development and Governorship aspirant of the All Progressives Congress (APC), Kayode Fayemi, has condemned the disruption of the party’s governorship primary election by hoodlums. He said he believes the hoodlums were working for some of the governorship aspirants. Fayemi in a statement signed by his Special Adviser on Media, Yinka Oyebode said the party does not deserve the type of ridicule which the act of the hoodlums had subjected it to. “The disruption of the primary election was the height of desperation on the part of some aspirants, who having seen defeat staring them in the face, conspired together to ensure that the exercise was not concluded. “The aspirants resorted to violence and destruction, having realised that he was already in a clear lead in the five local governments that had cast their votes,” he said. The primary elections which held on Saturday in Ado Ekiti ended inconclusively after some thugs invaded the venue of the election breaking the ballot boxes. The governorship aspirant said he was not surprised by the disruption of the exercise. He alleged that security agencies had, a few days to the primary, been notified of plans by some aspirants to deploy hoodlums to disrupt the voting exercise. “Security agencies took note of the information and promised to beef up security at the venue. “It is quite painful seeing some desperate elements trying so much to rubbish the party we all laboured to build to national reckoning, out of share lust for power,” he said. Fayemi, therefore, urged supporters and party members not to be discouraged by the act noting that better days are ahead.